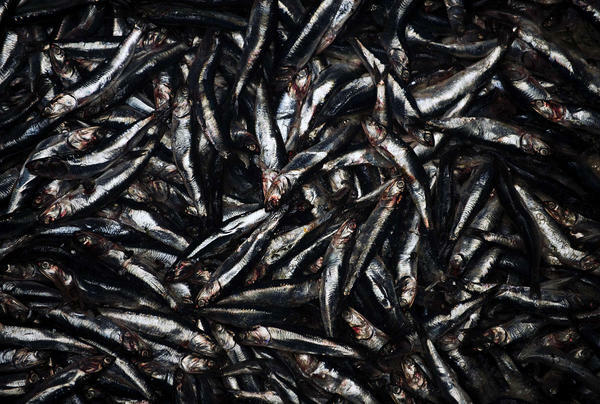 Anchoveta are processed at a fish meal factory in Lima, Peru in 2009. Peru and Chile have the world's largest anchoveta fishery, making them the world's largest producers of fish for fishmeal. Most of us don't spend a lot of time thinking about what the farmed seafood we eat might itself be eating. The answer is usually an opaque diet that includes some kind of fishmeal and fish oil. Fishmeal is usually made from ground-up, bony trash fish and forage fish — like anchovy, menhaden or herring — that nobody is clamoring for, anyway. Except researchers now say these are the very types of fish that may be more valuable to humans who eat them directly, rather than being diverted toward aquaculture and other uses. In a new study out Monday in the journal Fish and Fisheries, researchers say that the vast majority of fishmeal is actually made up of fish deemed suitable for "direct human consumption." Currently, a quarter of the world's commercially caught fish, 20 million tons of wild seafood, is directed away from our dinner plates every year, and instead, is used for fishmeal production. Researchers say a whopping 90 percent of that catch is considered "food grade" and could be eaten directly, potentially creating an important source of nutrition for those in developing countries at risk of food insecurity. "I was expecting there to be more truth to the argument that most of these fish don't have a place for human consumption, that there's generally not a market or a possibility of a market for these fish, but that's not what we found," says lead author Tim Cashion, research assistant at Sea Around Us, a project at the University of British Columbia's Institute for Oceans and Fisheries that works on globally reconstructing marine catches from 1950 to present. Of the 20 million tons of fish destined for fishmeal production each year, Cashion says most of it, an estimated 70 percent, is directed towards aquaculture, followed by pig and chicken production that uses it to speed growth and provide important nutrients. When we think of farmed seafood, American appetites keep shrimp and salmon at the top of the list, but globally, it's fish like tilapia or carp that are most widely farmed. In the past, those species were typically not fed fishmeal, but researchers say that's no longer the case. "Species that weren't being fed with fishmeal and fish oil before are now being fed it to supplement the diet. A good example of that is carp production in China," says Cashion, noting that China farms the majority of aquaculture production in the world. Indeed, a 2013 study of three Chinese provinces found that "virtually all carp and tilapia farmers... use manufactured feeds containing fishmeal." So fish that were once filter feeders or grew on vegetarian feed, are now fed a diet that relies on fishmeal to help speed growth, adding even more pressure to a finite resource like forage fish. But there's evidence the trend can go in the other direction as well. The salmon industry has been making strides in lowering the amount of fishmeal and fish oil in its feed by incorporating alternatives like soybean or algae. And Atlantic herring, once used heavily for the fishmeal/fish oil reduction industry, is now sought after for direct human consumption. "We've now seen this fishery flip," says Cashion. "That's changed in the last 15 years. People started eating these fish again, and there's larger export market opportunities to Japan and Europe, too." But perhaps it's not enough. For example, Peru and Chile have the world's largest anchoveta fishery, making them the world's largest producers of fish for fishmeal. Plenty of us know that anchovies are delicious and can be a coveted secret ingredient, but they're not always embraced like they should be. "Generally, over the world, a lot of people eat anchovies. In Peru they used to eat anchoveta, and now that they have an industry, they eat very little," says Cashion. And Cashion warns, the types of fish being used in fishmeal production is actually expanding. Species like pompanos, drums and miscellaneous marine crustaceans, sometimes sourced from bycatch in shrimp trawl fisheries, are also now being used for aquaculture. It's a troubling trend at a time when the U.N. is issuing warnings about making food systems more resilient to climate change, and when other predictions include malnutrition warnings for millions related to global seafood catch declines. "In a world with many food insecure populations and people that could substantially benefit from having more fish in their diet ... that we're using 20 million tons of fish to feed aquaculture and livestock production? I think people should care about that," says Cashion. For most American eaters, fish like fresh sardines can be difficult to source and even more intimidating to prepare. And few restaurant diners gravitate toward choosing fish like anchovy or herring first. "If you look around the world at all the cuisines that rely on these oily, healthy fish throughout the centuries, they haven't found it hard to prepare. Preparing isn't the problem — it's creating a culture of desiring them," says New York-based chef Dan Barber, author of The Third Plate. "One doesn't covet a sardine the way we covet a halibut." Barber makes a good analogy when comparing typical forage fish to land-based grain crops. "It's true on the farm as well. We eat wheat and corn and rice, but we don't eat millet, rye or buckwheat. They're the sardine equivalent," he says. "They have high yields, they're beneficial to the ecology in the same way smaller fish are, yet we don't have a culture around eating rye the way Europe does, or millet in North Africa or buckwheat like Japan." Beyond the important human health benefits of including fish in our diets, especially for vulnerable populations, there are broader consequences to our global dependence on fishmeal. Marine mammals and seabirds depend on populations of small fish, too. We've seen first-hand how an El Nino-fueled crash in sardine stocks off the U.S. West Coast recently meant starving sea lion pups. And similar declines can impact higher-value fish like salmon, cods or tuna that depend on robust forage fish populations. Fish destined for fishmeal production means less food for more coveted wild species like salmon, cod or tuna higher up the food chain, Cashion says. Like other vexing food production problems, there's no easy answer for how to successfully redirect fish headed for fishmeal production toward our dinner plates instead. Cashion says large-scale change needs to be driven by governments, intergovernmental organizations and nonprofits that will promote food security through "direct human consumption" of fish. Make it happen, he says, "and there'd be more high-quality fish available to humanity as a whole."